18", 24, 36",48" and 60"
SuperPremium Chrome 5" Diameter Exhaust Stacks for Truckers with Miter Cut and Expanded end has a 5" Inside Diameter. Expanded End has a 5" Inside Diameter. 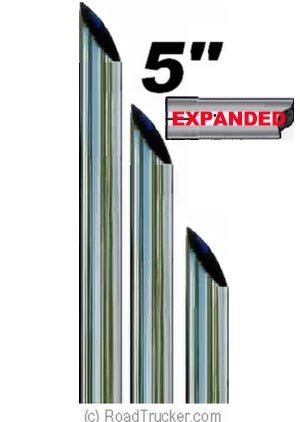 Length is 18", 24:, 36",48" and 60". Plain = 5" OD; Expanded = 5" ID. 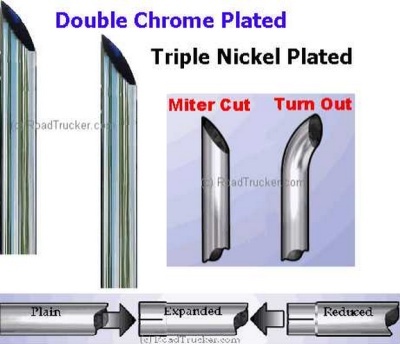 RoadTrucker also carries a line of 6" Miter Chrome Truck Exhaust Stacks. Buy 1 - Get 2nd Stack for 1/2 Price! Note: Change the Quantity to 2 to get your 2nd Stack for 1/2 Price. For example, 1 60" Plain Stack is $159.99, the 2nd is 1/2 Price for $80 for a Total Price of $240. The Cart will change to show 2 Stacks for $120 each Total $240). Note: The Expanded ends are 4" in length and about 1/8" difference in size and made to fit over the outside of a 5" Stack. Is it Really the Chrome? Our photos do not come close to showing the beauty of these Truck Stacks. Chrome Photos are so hard to get right, especially for an amateur like myself. But you should be able to get a good feel for them since a bright brilliant chrome is something we all have admired. You can use the photos to chose the style you want. RoadTrucker® carries Chrome Exhaust Stacks in both 5" and 6" diameters. We have 3 basic styles, Miter Cut, Turn Outs & Bull Horn (see right photo); And 2 basic End Types, Plain and Expanded.